Talento es Trending Topic... empresas y profesionales. Talento es Trending Topic. Experiencias de empresas y profesionales. 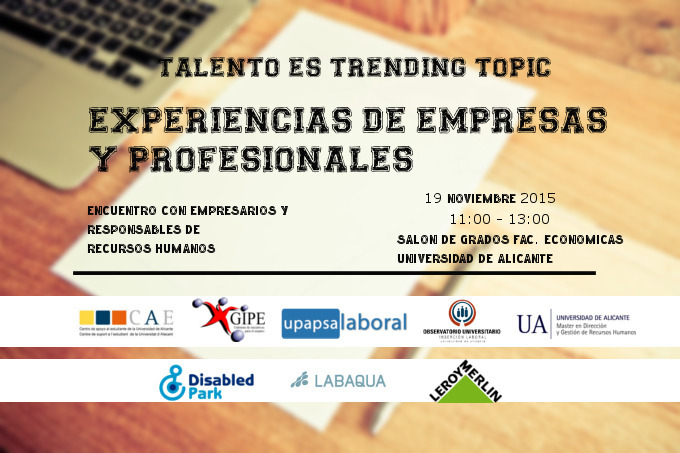 Thursday November 19, 2015, from 11:00 to 13:00, at the Hall of degrees of the Faculty of Economics and business administration of the University of Alicante, will conduct the day "talent is #TrendingTopic. Experiences of companies and professionals'. During this journey they will be announced some of the opportunities and choices that the students have to be incorporated in the companies after passing through the University; We will discover what are looking for companies newly graduates College and get to know the experience of various professionals in your transition from University to the professional world. · Eloy Martínez Parra | Technician labour integration of UPAPSA. · Esther Gallego | Technical support to the student. · Ana Montesinos doors | Co-founder of DisabledPark. · Rosa María Martínez | Resources Director human of Leroy Merlin Alicante. · Lidia Ferrándiz Sánchez | Technical human resources of LABAQUA. · Clear Manzanaro Cifuentes | Technician of laboratory of LABAQUA. You can sign up via this link. The day "talent is #TrendingTopic. Experiences of companies and professionals" is organized by the a student support centre (CAE), GIPE, UPAPSA labour, employment Observatory, and the Master in management of human resources of the University of Alicante. In addition, it has the collaboration of DisabledPark, LABAQUA , and Leroy Merlin Alicante.